The 2018 Tim Horton's Brier is all set to take place in Regina this year. It will be held at Evraz Place, beginning March 3rd, and it's bigger and badder than it's ever been. The tournament has expanded to 16 teams, which means there are now two pools of the countries top teams, competing for a chance to win the coveted championship. Last year's grand salami and former Olympic gold medallist, Brad Gushue, is the returning champ. He will be leading Team Canada; along with his teammates, Mark Nicholls, Brett Gallant and Geoff Walker, into a murky pond of wily veterans and hungry sharks. But before the bonspiel even begins, there will be an exciting wildcard match, between the two best teams who didn't qualify during provincial play. Teams Mike McEwen and Jason Gunnlaugson will meet on March 2nd, in a one-off tie-breaker. Loser goes home, winner earns the chance to win the Brier. 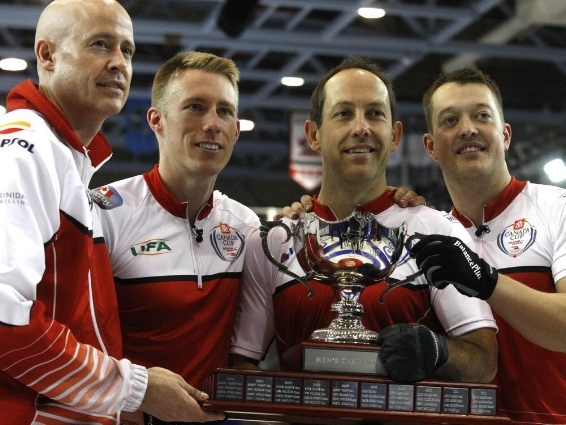 Brad Jacobs, another former Brier champion is the skip for Northern Ontario. They will be alongside Team Gushue, one of the favourites to win the event. But the competition is stiff in 2018. John Epping leads Ontario, Alberta is fronted by Brandon Bottcher and Jamie Koe will be representing the Northwest Territories. But keep your eyes peeled for Team Manitoba, this year. There is a lot of reason to believe that Reid Carruthers will lead this team to glory and his name will be held with the same regard as legends of the sport, like Kevin Martin, Russ Howard and Jeff Stoughton. Carruthers led his team, which also consists of Regina native, Braeden Moskowy, to victory in the deepest, most difficult province in the country; Manitoba. They had to outplay both Mike McEwen and Jason Gunnlaugson to get here and they don't seem to be on the verge of stopping there. Steve Laycock is leading team Saskatchewan again, only he isn't the skip this time around. He's handed the reigns over to the formidable Matt Dunstone. With them will be the Muyres brothers, Kirk and Dallan with Lyle as the alternate. Lots of free stuff to do on Friday 2 at Evraz Place. The Ford Hot Shots Curling Competition begins at 1:30 and Kevin Koe and his Olympic team will be there signing autographs. Think about this; if Koe's squad wins gold. Which they most likely will, that will mean, at the very most, 12 Olympic Gold Medal athletes will be kicking around Evraz Place. Brad Gushue, Mark Nichols, Brad Jacobs, Ryan Fry, EJ Harnden, Ryan Harnden, Caleb Flaxey, Kevin Koe, Marc Kennedy, Brent Laing, Ben Hebert and Scott Pfeiffer. Plus, Brent Laing is married to Jennifer Jones, and she's a gold medallist too. When else will you have the opportunity to meet 13 Olympic Gold Medalists in one place? And considering both Kennedy and Hebert have already won Gold's (Vancouver 2010, with Kevin Martin), at the very least, and still assuming Koe wins Gold, you will be able to see and possibly meet, at the very least, 9 gold medal athletes. Either way, there's gonna be a ton of Olympians there. Pool B: Manitoba - Reid Carruthers, Northern Ontario - Brad Jacobs, Ontario - John Epping, Sask - Steve Laycock, Quebec - Mike Fournier, New Brunswick - James Grattan, PEI - Eddie Mackenzie, Nunavut - Dave St.Louis. Pats Beat Warriors for the 2nd Time in Three Days.